FAQ: “We have a scientist here who is looking at films containing small bubbles and attempting to do measure them by measuring Haze% on a HunterLab spectrophotometer. I suspect her problem in obtaining numbers that “make sense” from what you get from just eyeballing the samples (and trying to look through them at the outlines of a object behind the film to gage the amount of regular transmittance) is that her samples have Haze% > 30 %, which means that a spectrophotometer (or even a haze meter) isn’t the appropriate tool to use for the analysis. Instrumental measurement is very appropriate for Haze% > 30; the measurement is just more nuanced. Haze% is a ratio of the amount of light scattered relative to the total light transmitted through a transparent sample. When our software reports Haze% > 30 if the sample scattering ratio of diffuse to total transmission is higher than this. ASTM D1003 only addresses Haze% up to 30% because the intention of the method was to quantify slight scattering in near clear, transparent samples similar to air for solids or water for liquids. When your measured Haze% value is above 30, your sample is no longer “transparent’. Your sample visually looks “milky” and is entering the category of “translucent”, where scattering is characteristic of the medium. Haze 30 standard (R) as part of a D1003- calibrated set (L) of 1%, 5%, 10%, 20%, 30% haze standards (HL# CMR-2760). Cut your sample path length significantly and measure Haze% below 30 per ASTM D1003. As long as you can clearly separate a sample of “good appearance quality”, say Haze% = 40, from a sample judged to be “bad appearance quality” (say Haze% = 50), your Haze% measurement > 30, while the sample range does not strictly conform to ASTM D1003, the application does work effectively in quantifying sample scattering and is acceptable for use. When you get in the range of Haze% > 60% to 70%, your samples are really translucent in nature and Haze% is probably not the most effective metric for differentiating good and bad appearance quality. 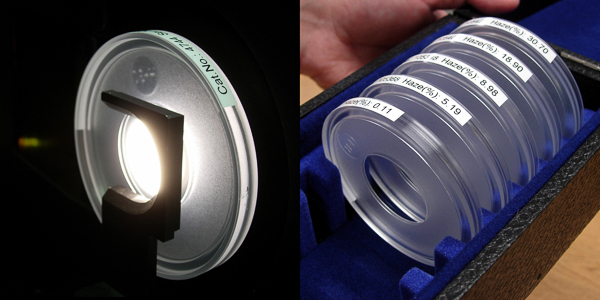 Instead HunterLab would suggest considering a Y Total Transmission measurement of the total amount of light coming through this translucent sample as being a more effective and faster measurement of appearance quality for your translucent samples.